Valentine’s Day is fast approaching so we asked our Global Tree Specialist Group (GTSG) members to tell us about their favourite threatened trees and why they love them. Lonely hearts don’t only exist in newspaper columns. Sadly all these trees are under a very real threat of extinction, our members share their stories of lost loves. Whilst looking through a new account of Sapotaceae for the Flora of Thailand I came across the mysterious Madhuca klackenbergii. What first drew my attention to it was that it had been collected in 1966 from North Eastern Thailand but was only described as a new species in 1998. 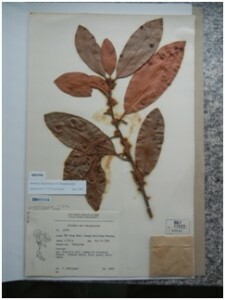 During a visit to the area in 2014 with researchers from the forest herbarium Bangkok (BKF) we spent a day looking for this species across the original collection locality and surrounding areas but reluctantly came to the conclusion that it had probably become extinct due to land use changes. From the dried herbarium specimen the species looks quite unremarkable- but beauty is in the eye of the beholder and I for one would have loved to have seen the living tree in flower and fruit. Unfortunately it now looks likely that no one will ever have the chance to see, smell or study its beauty ever again! I love ebonies but there is one in particular which springs to mind! Seeing the only confirmed individual of Diospyros hemiteles was rather emotional, especially considering that the species was named “hemiteles”, or “half fulfilled”. This is because there were originally two trees known at the type locality of Cabinet in Mauritius, but the male individual died in 1954. This left a very lonely female individual that still survives today, the large tree with the dark bark behind the leaves in the photograph above. The female tree has been without its mate for 60 years now. How’s that for a Valentine’s day story of lost love! Although the above stories highlight the sad fate of many species, it is not all doom and gloom for the threatened trees of the world. The Global Trees Campaign is working with our partners around the world to prevent the extinction of the world’s rarest trees with great success as can be seen below. 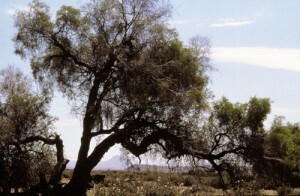 One of my favourite trees is the Mpingo or African blackwood, Dalbergia melanoxylon. Probably not renowned for its beauty, this valuable tree species produces exquisite timber used in fine carvings and musical instrument manufacture. Over the past 15 years and with support from Comic Relief and other generous donors, extraordinary efforts have been made to ensure that supplies of the timber are managed sustainably for the benefit of local people in Tanzania and the future of the species. With the help of Mpingo Conservation & Development Initiative, a partner of GTC, many communities can now receive 250 times more money for their forest resources whilst managing them responsibly. You can read more at www.mpingoconservation.org and see a full profile here. What’s not to love about a story with a happy ending. What is your #OneTreeLove? For some inspiration, see our threatened tree profiles here and share your thoughts with us in the comments and on Twitter @globaltrees. 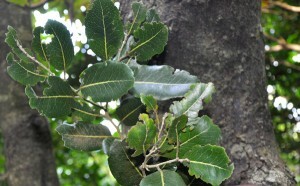 To find out more about our projects to save threatened trees, visit the GTC project pages here. My #OneTreeLove is a Gigasiphon macrosiphon I have in my atrium. It’s less than a meter in height but growing well and I’m happy to share my life with it for now. Not sure about the provenance of the seed it came from, but I bought the plant from a grower in Florida, USA. I plan to donate it eventually to a public conservatory in California; then it’ll have a place to both flourish and play a role in conservation education. I would like to learn about a dragon tree we have on our property and wish to learn more about it specifics.